2013’s Now You See Me wasn’t just about showmanship and misdirection, it was showmanship and misdirection. Brought to the screen by the sure hand of director Louis Leterrier, this was a triumph of style over substance - a flashy, fast-paced caper movie that employed its own brand of illusion to camouflage a surfeit of plot holes and inconsistencies. The film was a surprise hit and, as a result, the principal characters have been brought back for a return engagement (or at least most of them have). This time around, however, the magic has fizzled. Based solely on merit, Now You See Me 2 is a sequel that should never have been made. There are two reasons why Now You See Me 2 isn’t as successful as its predecessor. The freshness is gone. The first movie was an unexpected pleasure; this one comes saddled with the weight of expectations and it can’t live up to them. It also isn’t as well-written. To be fair, many of the tricks and illusions in Now You See Me were accomplished with Hollywood special effects but, this time around, they are so overblown and unlikely that it’s impossible to believe a real-life illusionist could accomplish them. The filmmakers are unable to disguise this and it hurts the movie’s credibility. Following their climactic heist at the end of Now You See Me, The Horsemen have gone to ground. After a time, their new leader, CIA agent Dylan Rhodes (Mark Ruffalo), calls them back into service. Returning are master illusionist J. Daniel Atlas (Jesse Eisenberg), hypnotist Merritt McKinney (Woody Harrelson), and street magician Jack Wilder (Dave Franco). Replacing Isla Fisher’s Henley Reeves is Lizzy Caplan’s Lula - after all, The Horsemen need a little estrogen to go along with all that testosterone. Joining returning bad guys Thaddeus Bradley (Morgan Freeman) and Arthur Tressler (Michael Caine) is Daniel Radcliffe’s Walter. Radcliffe, of course, is no stranger to magic but, on this occasion, he wants to hire/blackmail others into doing it for him. The goal is a godlike computer circuit board that will allow the possessor to have access to everyone’s private information. 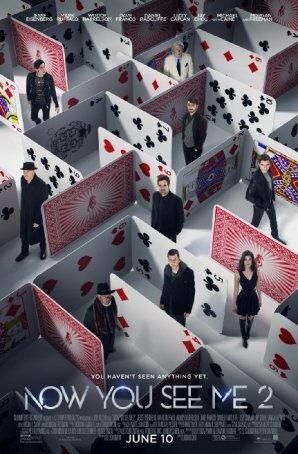 Part of the fun of Now You See Me was watching how the heroes would use magic to escape various untenable situations. Now You See Me 2 re-applies the formula but does it using deus ex machina resolutions. The “solution” to the first big trick (which involves a pipeline from New York City to Macau, China) is so contrived it’s not worth contemplation, and there’s nothing director Jon M. Chu (who has a long history of helming sequels) can do to obfuscate its idiocy. Things don’t get better from there. Every time the movie explains a trick, we’re left shaking our heads. In order for the climactic illusion to work, all the victims would have to be utter morons. This may not be among the dumbest screenplays of the year but it’s among the most disappointing ones. Acting and showmanship, two hallmarks of Now You See Me, are curiously muted in the second installment. There’s a lot of Oscar power in the cast - 17 nominations and three wins - but the performers in Now You See Me 2 are just saying their dialogue and having fun. There’s not a lot of urgency or suspense. And, unlike in most caper films, we’re not invested in the crafty scheme the characters are planning for the heist because we know it will involve Hollywood magic and therefore won’t be plausible or interesting. As for the showmanship aspect - the Horsemen only do two live performances. The first is truncated and the second is excruciatingly unbelievable in terms of what it delivers. Suspense of disbelief is crucial for a movie like Now You See Me 2. For the original movie, the filmmaking was such that we were willing and able to get to that point. Not so this time. The seams are visible, we see the man behind the curtain, and the sleight-of-hand isn’t quick enough. The concept of a gang of magicians operating as international spies has potential but this entry (into what is planned as a long-running series) represents a significant miscalculation. Whether or not audiences pull a disappearing act, Now You See Me 2 doesn’t bring magic back to the multiplex.